Invisalign teen is the virtually invisible way to straighten a teenager’s teeth without the restrictions that come with traditional braces. Instead of brackets and wires, Invisalign Teen uses a series of clear, removable aligners that gradually shift all teeth into their new places. Is it just as effective as braces? In the right cases, yes. In the hands of a trained orthodontic specialist, this option is just as effective for the most common orthodontic improvements. It can effectively treat mild to moderate cases of spacing, crowding, underbite and overbite. What are the advantages of Invisalign Teen over traditional braces? Aesthetics mostly: because Invisalign is clear, it’s a less evident option, which highly appeals to teens who want to look their absolute best without braces getting in the way. Plus, because they are removable, they can be taken out for contact sports, family photos, and eating certain foods which would interfere with braces, like apples and popcorn (because what teen doesn’t love popcorn while watching a movie with friends?). Also, because a wire is not in place, brushing and flossing is much easier. It is greatly beneficial for sports, because many injuries of the mouth are made much worse with braces. Not to mention how much easier it would be to play an instrument with a removable aligner if your teenager is involved with the school band. Most teens would rather have a comfortable and less obvious option than braces to go with their ever-increasingly busy social lives, and Invisalign Teen is the perfect solution. Who is eligible for Invisalign Teen? Any teenagers who are either still losing baby teeth or who already have all of their adult teeth. 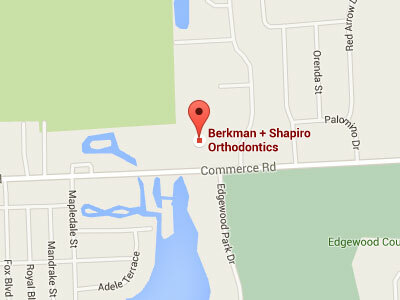 Dr. Berkman or Dr. Shapiro, both trained and licensed orthodontic specialists, will be able to evaluate any teen’s specific bite to determine whether Invisalign Teen or braces are best in any specific case. The average treatment time is about the same as with traditional braces, but most cases last around a year or so. At your first visit with your office we’ll be able to tell you our prediction for the actual length of your individual treatment. You must wear them 20-22 hours a day for them to be completely effective, but that is still better than wearing braces 100% of the time! For more information on Invisalign Teen and its benefits, please be sure to visit our blog post on Invisalign: Good for Teenagers?